*Click on any green text to follow that link. 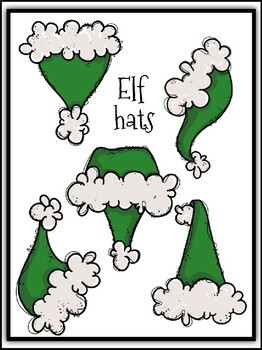 Brighten up the season with these adorable Santa & elf hat graphics. 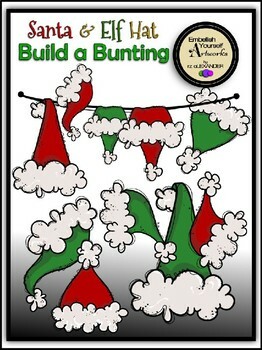 Create your own Christmas cheer buntings, borders, corner accents, page dividers or whatever you can think to create! You can even print and cut for name badges, classroom tree ornaments, award certificates, bulletin board messages or use for art coloring projects! 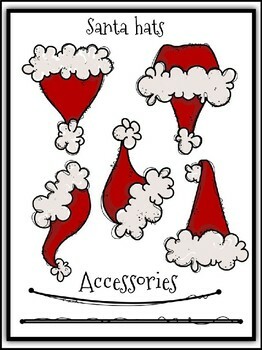 This 17 piece set includes 5 styles of hats, each one in white fill, green & red and a curved & straight rod hanger so you have the options to create many amazing resources! My designs are created freehand unless otherwise noted and before a purchase check them out…. 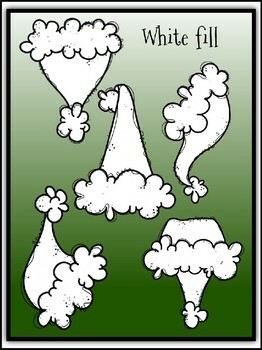 the entire set can be easily seen in the TpT product preview for your convenience. -Embellish Yourself images are high resolution, are saved in .png format for a crisp, clean result and have a transparent background. -All creations are the sole property of r.z. aLEXANDER and should not be redistributed, altered, copied or reproduced in any way without proper approval.